The weather this week has been fairly changeable. Within the same day we see cycling of bright sunshine and torrential downpours. This in itself isn’t too unusual and should you be particularily averse to wet weather may I suggest that Yorkshire is not an ideal holiday destination for you. On the upside brambles are now flowering and the lime trees in our village are finally getting in on the action. All the rain should hopefully aid in the ensuing nectar flow. Following the LARGE prime swarm from this hive at the beginning of June I haven’t been aware of any cast swarms. It is certainly true that I could of missed them but the activity seems fair and I saw some pollen heading in last week. I will take a nose in at the weekend as it will be one month since the prime swarm left there is a good chance I will see capped brood. I should easily be able to see capped brood from observing the comb from underneath. To see eggs and larvae I would have to remove the combs. I am despirately trying to observe something like a warré approach for this hive but I really do not want to lose the genetics. These bees directly desend from the first tiny cast swarm under Queen Phoebee that started me as a beekeeper and they are calm, healthy, and treatment-free. Should this hive have successfully raised a new queen she will be called Asteria (Starry one) who was a Titan Godess and daughter of Phoebee (though technically she is her grandaughter) in greek mythology. 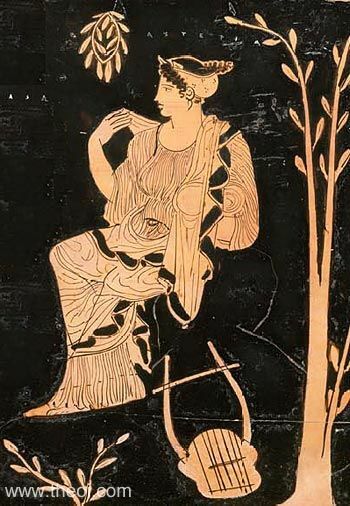 WIKIPEDIA:The Titan goddess of nocturnal oracles and falling stars, Asteria flung herself into the Aegean Sea in the form of a quail in order to escape the advances of Zeus, and became the “quail island” of Ortygia. This then became identified with the island of Delos, which was the only piece on earth to give refuge to the fugitive Leto when, pregnant with Zeus’s children, she was pursued by vengeful Hera. Steve’s warré recieved the sizeable prime swarm from my warré hive with Queen Mata Hari by virtue of the large amount of comb it contained from colony that failed to make it past march. Although this was a three box hive (warré swarm traps are usually comprised of two boxes) the large amount of comb has given them a good start. I expect I will need add a fourth box to this hive at the weekend to stop them swarming again. Although I am not counting on it there is a chance this hive may generate a honey harvest this year which I expect Steve and I may split. Should my warré fail to raise a queen I could possibly transfer a small section of eggs from the lower box of this hive to give them another chance to raise one. I will be sorry to see these bees go as I am incredibly impressed by their ability to over winter of honey fumes, in a box held together by gaffer tape and will power but they made their choice. Steve came and visited them just after they moved in and is very happy to have bees again. They’ll be staying with me a little longer though as he still doesn’t have anywhere perminant to put them. This is a very small cast swarm that I found in my apiary on 27th June. On investigation of my hives it appears as though this swarm came from Poppy hive (update below). There were really not many bees at all. I intially gave them an empty comb to get settled on and when I inspected a few day later there were only enough bees to cover that comb and be building one other. I moved them out of the bait hive and into a full top bar hive on friday evening. Queen Dog rose had managed to lay an egg everywhere she could fit one but obviously with so little comb she was limited. I gave them another empty comb when I moved them over to help them. 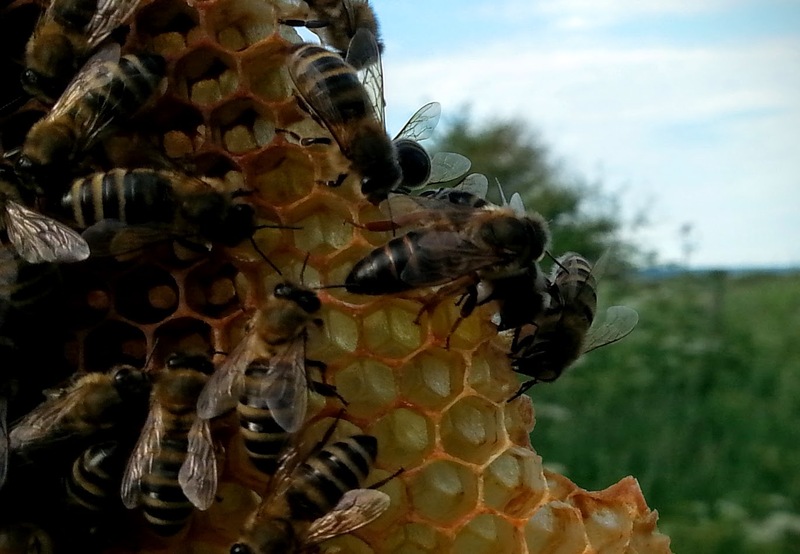 The gift of comb is a big one for a cast swarm as their bee number make it difficult for comb building to take place. They then really only have a small amount of time before the temperature drops below that where working wax is possible for them. Care should be taken though that you don’t provide so much comb that the bees cannot cover the brood the queen will eventually put there. I will feed in another new comb in a week or two. So this was the hive containing Queen Poppy but as I said above Queen Poppy appears to have eloped. Despite the bait hives I have out in the area Queen Poppy’s swarm has evaded me. Though previous inspections told me swarming was on the cards the cast was the first indication anything had occurred. On the same day as finding eggs in Dog rose’s hive I broke appart the cross-combed brood nest of Poppy’s hive and found numerous empty queen cells, empty brood comb, and no new queen. The colony appeared to have swarmed itself out! I slept on it over the weekend and battled with myself over whether or not to let this colony dwindle out. Since it is a colony in a standard supported hive type (the only one I have) I decided to put a call into my beekeeping association to see if anyone had a small nuc I could combine them with. I found a new queen breeder about 10 miles away in a village call Hunmanby. On Tuesday I visited the breeder, shelled out some cash, and brought home a three frame nuc containing my first ever marked queen. Both my children decided they wanted to help so after dinner we headed over to the apiary. My intention was to dust the nuc frames in icing sugar, slot them in and walk away. I thought I would do one last check in the brood nest. Those who are familiar with such stories will already have seen the twist coming. The brood nest was loaded with new eggs. One per cell, beautifully centred and standing to attention. Day old eggs! The hive has a queen and I just haven’t been able to find her because of cross-comb and incompetence. So I guess I have a new colony. I will check the hive again at the weekend to make sure they don’t turn out to be drone brood. The new queen will be called bramble after the nectar flow she was born into. Perhaps you also saw this name coming considering the village the colony hailed from but I love the name my daughter decided on. This colony is currently in a nuc and very short of stores being as they are just three frames of brood. I will give them some honey from the poppy hive at the weekend. It is the least they can do. Looks like I will have to buy some more equipment to add to the not inconsiderable cost of the bees (those living outside of the UK you really have no idea how much bees cost here). Hopefully they aren’t too weak to take advantage of the lime and bramble nectar flow. This entry was posted in Beekeeping, mistakes to learn from, Warré and tagged balanced bee keeping, balanced beekeeping, kenyan top bar hive, kenyan topbar hive, kTBH, natural bee keeping, natural beekeeping, top bar hive, topbar hive. Bookmark the permalink.